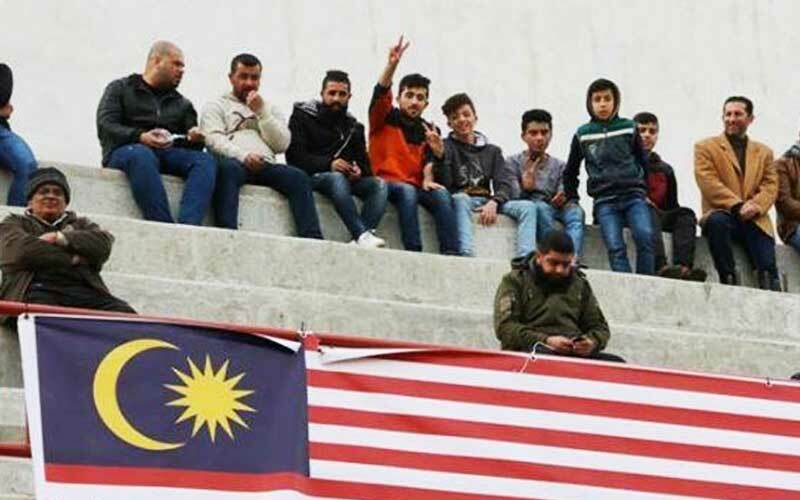 At Yarmouk Stadium, one of the oldest stadiums in Gaza City, Palestinian football fans celebrated Malaysia’s stand by flying the Jalur Gemilang during a match on Saturday. Next to the flags was a banner stating support for Prime Minister Dr Mahathir Mohamad and other ministers for their stand against Israel. On Sunday, football fans continued to celebrate by putting up Malaysian flags and the same banner at Palestine Stadium, the home of the Palestinian national football team which was bombed by Israel in 2006. “The (display of flags and the banner) at the football fields is a show of support for Malaysia, to show how Palestinians are glad. “Malaysia’s stand was well received by Palestine, especially in Gaza,” Palestinian Cultural Organisation Malaysia chairman Muslim Imran told FMT. He said the Palestinian people were quick to respond on social media under the hashtag #SupportMalaysia, with shows of solidarity widely spread over Facebook, Twitter and Instagram. Putrajaya previously announced that it would ban Israeli athletes from competing in the 2019 World Para Swimming Championships to be held in Kuching, Sarawak, from July 29 to Aug 4. Foreign Minister Saifuddin Abdullah later said Malaysia had imposed a blanket ban on all Israelis participating in events hosted in the country. Addressing the Oxford Union in Britain on Saturday, Mahathir also reiterated the government’s stand against the Israeli athletes. Israeli foreign ministry spokesman Emmanuel Nahshon had condemned the ban, saying the decision was inspired by Mahathir’s “rabid anti-Semitism”. However, Youth and Sports Minister Syed Saddiq Syed Abdul Rahman said Israel was indisputably the biggest hypocrite in its condemnation of Malaysia. He said Israel condemned Malaysia for allegedly “politicising sports” but had forgotten how it illegally appointed itself as the “guardians” of Palestine by deciding who could and could not play against Palestinian athletes in their very own country. “Has hypocrite Israel forgotten how they illegally control which Palestinian athletes can leave their homeland for training or tournaments?” he asked.